We had a happy Christmas with our family and I hope you had the same! love the log TV in the background! when the duck faces started I passed the camera and everyone took selfies...very funny! Guess who found the almond in the rice pudding and won the prize?!?! Definitely beginners luck! 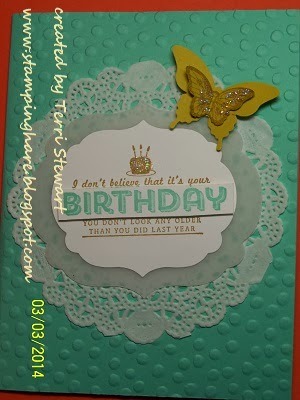 I have several pieces of Stampin Up news to share plus an updated class schedule---don't miss the Easter card class this Wednesday, March 26th, 7-9pm, contact me today to save your spot. Stamp with Stampin Up home office on March 26. Stampin Up will be streaming a stamping session on YouTube featuring the All Wrapped Up bundle from the Sale-a-Bration catalog. Even though I didn't purchase the bundle I plan to watch--I'm sure there will be some nifty tips and ideas This class is open to everyone so grab a few friends and get inspired together! 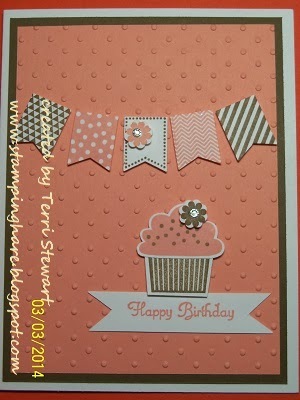 There are 3 sessions, all featuring the same projects; sessions at 7:30pm, 9:30pm, and 1am (ET) on Stampin Up's YouTube channel http://www.youtube.com/user/stampinupvideo. Speaking of Sale-a-Bration (SAB), the end is near! SAB will end on March 31 and the exclusive SAB products will retire forever. Place a $50 order and select a free, exclusive item SAB for free! Place your order today before it's too late! 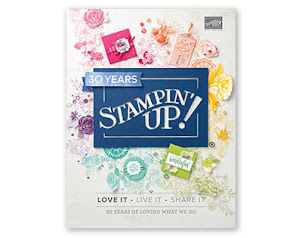 Stampin Up announced free convention registration for new demos; this is a $295 value! Join my Stamping is Fun team during SAB and you can select up to $150 worth of products for just $99 (plus tax)--and get your convention registration for free! Want to know more? Click here. Join my team today--we'll have a blast at convention! There's still time to join My Paper Pumpkin (MPP) and receive a free set of In- Color marker; through March 31st new subscribers receive a free set of markers. The MPP kits have been super-sized--more cards, photopolymer stamps, embellishments, etc! Plus, current MPP subscribers can now purchase past kits; click here for details. Subscribe now and you can order previous kits! 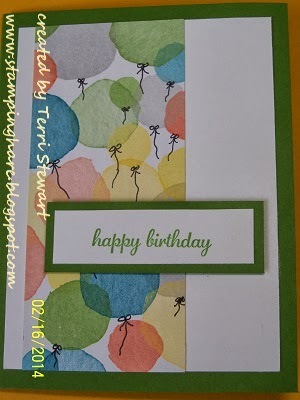 Stampin Up's 25th anniversary year is winding down. The 25th anniversary Best of... stamp sets retire after March 31st; click here to see these exclusive sets, then order your favorites today! 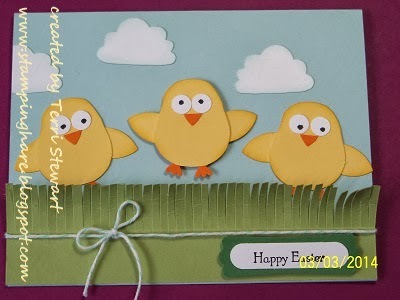 Easter cards, Wednesday March 26, 7 to 9pm; make 4 cards. Tuition is $10 or free with a minimum purchase. RSVP today! 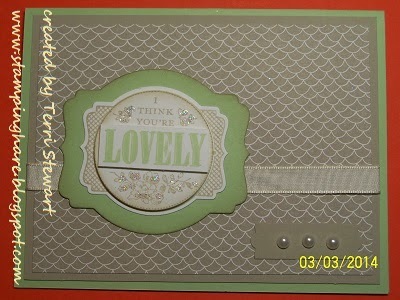 Card-in-a-box class, April 7th, 7-9pm. Card-in-box is the hottest thing on pinterest boards. 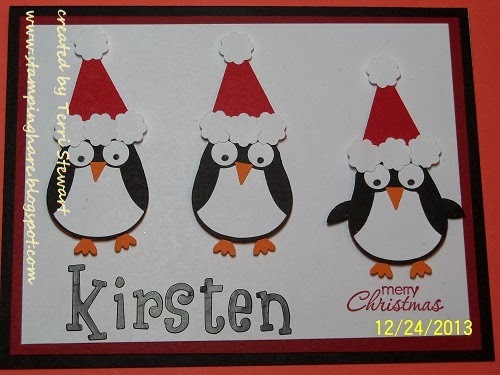 Make 2 cards; tuition is $10 (or free with a minimum order), includes a template. Mother's day (or feminine birthdays--your choice), April 17th, 7-9pm; make 4 cards. Tuition is $10 or free with a minimum purchase. Call today! 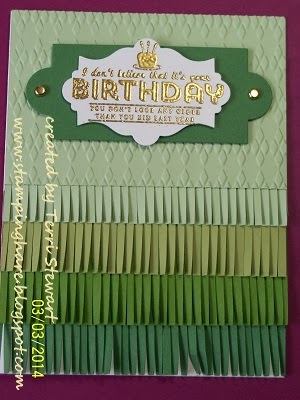 Spinner card class, April 29th, 7-9pm; make 4 cards. Tuition is $10 or free with a minimum purchase. Masking tape technique, May 13th, 7-9pm; make 4 cards each featuring the masking tape technique. Tuition is $10 or free with a minimum purchase. Father's Day (or masculine birthday cards--your choice), May 23rd, 7-9pm; make 4 cards. Tuition is $10 or free with a minimum purchase. Farewell to Retiring Stamp sets, May 27th, 7-9pm;; make 4 cards featuring stamp sets retiring on May 31st. Tuition is $10 or free with a minimum purchase. Card classes in June, themes and techniques to-be-determined; dates are June 10, 18, and 26. Tuition is $10 or free with a minimum purchase. I received some fantstic handmade Christmas cards. I'm sure you'll agree I am lucky to have such creative friends! 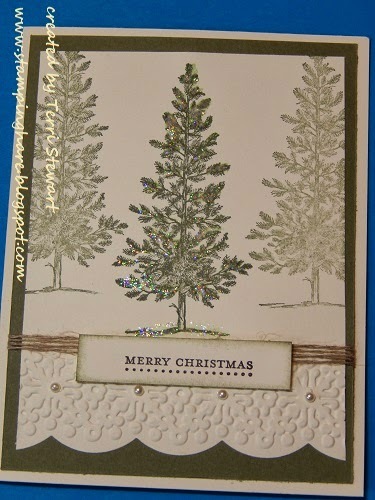 Stamping is fun...especially when you get cards as lovely as these in your mailbox! Ombre (graduated color, light to dark) is very trendy right now. 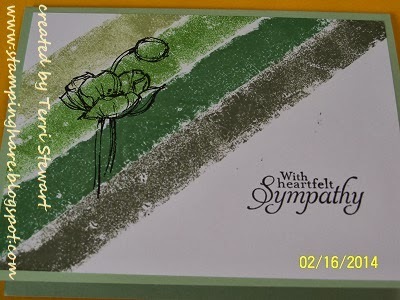 I'm jumping on that trend and offering a Green Ombre card class this Friday, March 7th, 7-9pm; tuition is $10. Contact me ASAP to reserve your spot. Stampin Up's 25th anniversary year is quickly coming to a close but there is still time to order "Best of..." stamps sets; available through March 31st. Don't wait, place your order your now! New personalized stamps with monograms are now available--check out the possibilities, click here to view a few ideas I found on pinterest, then get yours today. Sale-a-bration (SAB) is in full swing -- chose a free SAB product with $50 purchase. Gather a few friends and let's have a party, you get fabulous hostess benefits ($30 more in free hostess dollars with a qualifying party) and they get SAB free products! Hurry SAB ends March 31st--call me today to schedule your get together. 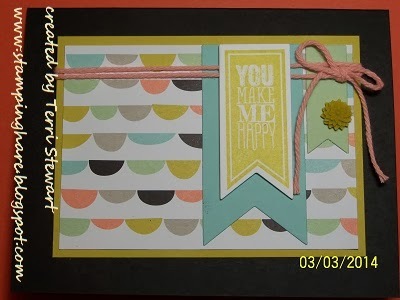 New Hip Hip Hooray card kit has everything you need to make cards---stamps, ink, cardstock, embellishments, etc. This is the easy button for card-making. Order your kit today! There's still time to sign up for My Paper Pumpkin and get a set of free In-color markers, this offer has been extended to March 31st. 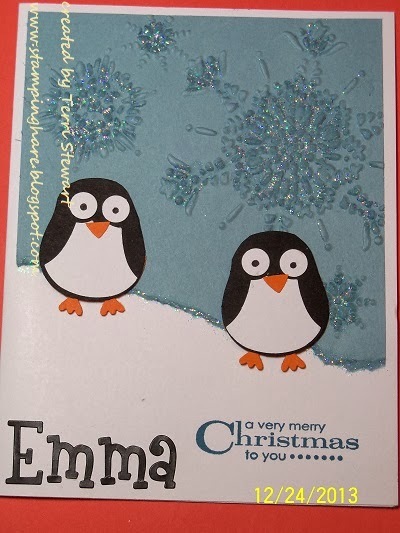 The monthly kits are being stepped up--expect more cards in each kit, more embellishments, etc. Subscribe today! Join my Stampin Up team during SAB for just $99 then choose $150 of products for your kit--and shipping is FREE! Whether you are looking to generate extra cash or just want a discount on quality papercrafting products, now is the time to join. Check it out and join today! 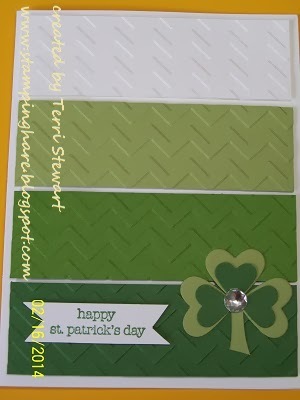 March 7th, Green Ombre class, 7 to 9pm; make 4 cards using a variety of Ombre techniques including a St. Patrick's day card. Tuition is $10 or free with a minimum order. 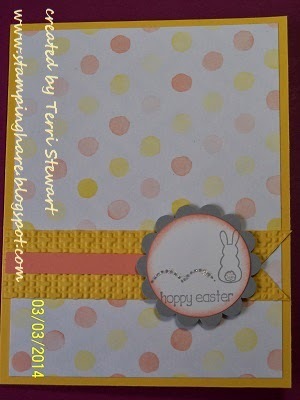 Easter card class, March 26th, 7 to 9pm; I'm calling this the punchy, Eggstra Spectacular card class--it features many punches and the Eggstra Spectacular stamp set. Tuition is $10 or free with a minimum order. Every year I make special Christmas cards for my kids--and this year my new son-in-law, too! I personalize them by putting their names on the cards. This year I used stickers for the personalization...I think they turned out nice!